Luxury villa with Private Pool in large gated garden 10 minutes to many beaches. Luxury villa with private pool in peaceful village, completely renovated. Set in a 2000sq.m, enclosed Mediterranean garden with orange, lemon, olive and pepper trees overlooking countryside. There is an Outdoor kitchen with built in barbeque and bread oven, many area's to dine or just enjoy the moment. Large luxury kitchen/dining room with three french doors opening to pool and garden. Lounge with Satellite TV and two french doors opening to a veranda overlooking the countryside. Mezzanine level games room with pool table, games console, TV for the games console and DVD player with a selection of cd’s for all ages. The villa has a large and family bathroom with a large corner bath and walk in shower and an additional ensuite with shower in the master bedroom. Casa Rosa is set in a typical Portuguese village with everywhere easily accessible by car. This region of Portugal allows you to discover the real Portugal. The restaurants are full of local people who love to eat out. They are mainly small restaurants cooking fresh traditional recipes at very reasonable prices. Only 10 minutes drive away you have the choice of several sandy beaches where you can relax with a drink, a snack or the dish of the day freshly cooked. A must is an ice cream parlour on the beach with the best ice cream made there each day and also freshly cooked waffles or pancakes. It is 15 minutes from Casa Rosa to the magical town of Obidos with white washed houses, many small shops selling a range of locally made crafts, gifts, clothes and ceramics. A choice of many restaurants and places to try the local liquor called Ginja. Also Approximately 15 minutes drive to the fishing town of Peniche where you have the best selection of fish restaurants serving that days catch or stroll around the harbour where you can take a boat trip to Belenga island. If it's golf you are looking for there are several courses, the closest is the golf at Praia d'el Rey. 20 minutes to the lagoon at Foz da Arelho which offers a range of water sports on the lagoon and many cafes serving food, coffee and drinks. The busiest town is the market town of Caldas da Rainha. A busy fruit and vegetable market is on every day except Sunday selling fresh locally grown fruit, vegetables, cheese, olives, freshly baked bread and so much more for a fraction of the price you pay in the supermarket. Lisbon is 45 minutes away, close enough for a day trip to explore this exciting city also the palace at Sintra or 1 hours drive north of the villa is the shrine at Fatima. 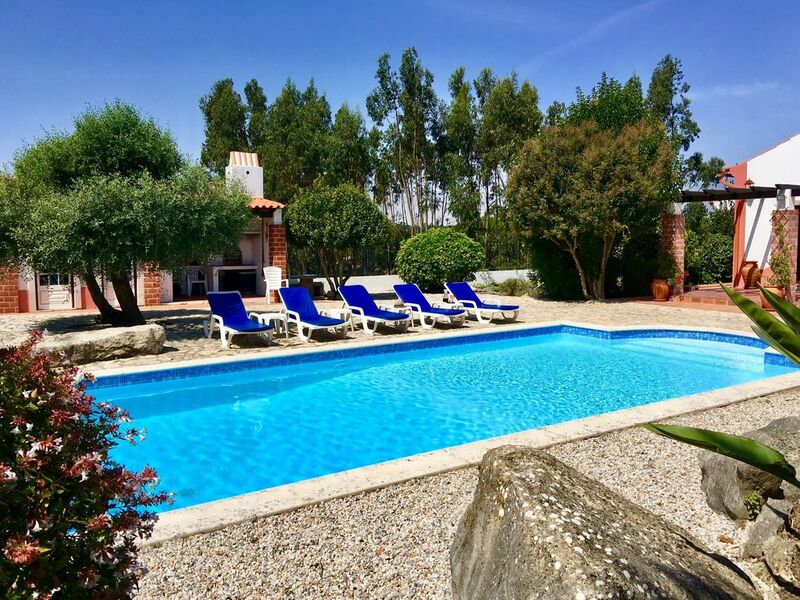 Casa Rosa is the perfect base to explore this beautiful region, the many beaches, the medieval town of Obidos, vineyards to visit and sample the wines and open countryside. Eat typical Portuguese food at a fraction of the cost you pay in tourist areas. Discover the real Portugal. I am married with two children, aged 27 and 20. I live in Kent in the UK. For many years we have always taken villa holidays and often found them furnished without love or attention to detail. Very basic. I had always wanted to buy a property and work to provide everything I would want for a perfect holiday retreat. 9 years ago the journey began, I have enjoyed every minute. With my husband working, I was often alone, driving for the first time on the right, exploring the region, working with local builders and sourcing materials locally. A huge challenge without any Portuguese. The result nine years later, is a home I've fallen in love with, many Portuguese friends and a little Portuguese language (increasing all the time!). Now I enjoy sharing this with guests who seem to love it too. The location in a very typical small village in this beautiful rural area is what I love about this region and my dream was to be part of it. To experience the relaxed, laid back and very friendly way of life that is typical here. I wanted privacy but not to be isolated. Reguengo Pequeno, Reguengo means small and it is a small village of white washed old houses, the people are very friendly. Set on the edge of the village you have a few houses to the front but once inside the gates you have total privacy. 10 - 15 minutes to beaches, golf and Obidos. It's only 45 minutes from Lisbon making an ideal base for an all year break. You have easy access to Sintra, Cascais, Fatima, Alcobaca and many more. You could totally relax, overdose on culture or tour the vineyards, just perfect! I have totally refurbished Casa Rosa. My goal was to provide a home where you would find everything and more than you expect. Basics like olive oil, vinegars and other items in the cupboard, ample crockery, not 6 of everything! Equip and furnish the house as I would my home not sparse as I have found other villas. I arrange for fresh bread, just baked to be left on the gate when you wake. The fish man comes to the village each day with today's catch. For peace of mind you have 24/7 emergency support from the management company for house issues and also if you need a doctor, dentist or hospital. I provide the little extras often missing in villas, to make it some where that's perfect, that you want to come back to. I believe I have achieved this but am always making it even better. Main bathroom re-fitted 2011 with large sunken corner bath seperate large walk in, wet room style shower, wc, bidet. Ensuite shower room, wc with double bedroom. Bathrooms are all newly fitted and luxury towels provided for guests to use. All beds will be made up for your arrival and towels will be supplied for use in the house. For bookings of two weeks a mid stay clean will be included where all linen will be changed. A washing machine and a tumble dryer is available. In the warm, dry weather I request washing is dried using the washing line provided saving power. There is a tumble dryer for your use. I request that if the weather is dry that you use the clothes line and pegs provided to save energy. The dryer is provided for use if the weather is rainy. Large log burning open fire in the lounge. Perfect on a winters evening. a supply of logs is provided outside summer season when the fire may be required. Double garage allowing you to park your car out of the sun. WIFI is provided for guests by means of a portable device. This allows you to have wifi on up to 10 devices. It can be used in the villa and also when out giving you secure WIFI at all times. Although the villa has two wood burning bread ovens only the one in the outside kitchen and barbecue area is in use. The one in the main kitchen inside the villa is not in use. A gas hob set in the centre island in the kitchen. There are two coffee machines. One is a filter machine and a Nescafe Dulce Gusto where you buy the pods and it does espresso and all the different coffees plus hot chocolate. Stacked with basics such as olive oil, red and white wine vinegar, salt, pepper. Also provided with welcome pack is local wine and bottled water. I have ensured Casa Rosa is well equipped with ample supply of everything. Plenty of crockery and equipped like a home with tupperwares, juicer, blender, cool box everything you need is there. Very large open luxury kitchen/dining room, the heart of the villa. High beamed ceiling with traditional bread oven. Oven/hob set in central island unit with bar stools, fridge/freezer, microwave, dishwasher, toaster, solid oak dinning table. Highchair. You have a very large dinning table in the kitchen / dinning area plus also several tables outside for dinning or enjoying a drink. Satellite TV in lounge giving you access to the main English channels. There is a satelite dish which enable me to receive the main english channels. There is a selection of cd's provided in the kitchen and a CD/ radio player. A DVD player is available up in the games room. There is a selection of dvd's also provided for your use. In the villa you will find a selection of books on the book shelf for you to enjoy. There is a pool table, games console, selection of games and dvd's all available in the games room for you to use. There are board games available in the games room. A small Sony system in the Kitchen where you can connect phones and play your own music or you can use any of the CD's provided. A selection of CD's available. There is a pool table upstairs in the games room. Young children should be supervised. There are games provided in the games room. A selection of dvd's are provided in the games room on the mezzanine level. These include children's and adults dvd's. A selection of games are provided for the games console in the games room. large Mediterranean garden divided into several areas. Gravel garden with Mediterranean plants, patio area with table for dining outside, veranda for afternoon sun, pool / barbecue area. The veranda at the rear of the villa enjoys afternoon and early evening sun. A favourite spot for afternoon tea & pastries or watching the sun set with a glass or two of wine from the local vineyard. A favourite place of mine, the terrace off the lounge to the rear of Casa Rosa with a small table and chairs. The best spot for late sun, afternoon tea or watch the sunset with a glass of local wine. Within a twenty minute drive you have golf at Praia Del Rey, a championship links golf course and also another less formal course at the Golf hotel near Consolacao. A little further away but still around 30 minutes is the Golden eagle course at Rio Major. Details of the golf courses will be available in the villa. There is a private pool for your use. This is available for use between the months of May and October. This will be cleaned weekly by a pool maintenance company. The photos do not do it justice! Spacious, fabulous garden, a home from home. Thanks to Sharon for a beautifully presented, well equipped and thoroughly enjoyable stay at Casa Rosa. The house was perfect. There was plenty of room for all of us and we loved the garden and pool especially. A great base for exploring the Atlantic coast and easy access to Lisbon and beautiful Tomar. We returned home very chilled. The Portuguese way of life definitely has had a good effect! Many thanks again. Thank you for leaving a review. I am delighted you all loved Casa Rosa, had a great time and found the Portuguese way of life agreed with you. You were great guests and you would be very welcome if you fancy returning some time in the future. Thank you for choosing Casa Rosa. Thank you for this great review. I am delighted that all loved Casa Rosa and this beautiful region of Portugal as much as I do. I would love to welcome you back and I look forward to hearing from you again. A very nice villa with all the facilities you and your family will need for a fantastic holiday. Sharon was very helpful before and throughout our holiday. There is lots to do around the region but a car is essential. The villa is set in a very quiet unspoilt place which we loved. Driving is essential to reach shops and restaurants. All in all we had a great time and will look to rebook in the future. Thank you for taking the time to leave a review. I am delighted that you all had a fantastic holiday. Yes Casa Rosa is set in a quiet and unspoilt area in Portugal in a small typical white washed village surrounded by farm land. All the main towns and beaches are within 10 - 15 minutes by car so if you are looking for quiet , unspoilt with easy access to everything then Casa Rosa is perfect. I am so pleased that this was one of the things you loved. You were wonderful guests and I would love the opportunity to welcome you all back sometime in the future. Thankyou for choosing Casa Rosa for you holiday and I look forward to hearing from you again. Fantastic stay in a beautiful house - very well kept. Very quiet relaxing holiday. Swimming pool fantastic - enjoyed lazy mornings around it before heading off to one of the beautiful beaches none of which were too far away. Favourites were Praia Branca - lovely day on the beach, dinner in the Italian and a wander around for a delicious chocolate sundae or waffles with strawberries ! Baleal another must - particularly good on a windy day as more protected. Obidos is a fantastic afternoon - wander around the interior walls of the castle. Really a beautiful town. Day trip into Lisbon - very accessible and super city with so much to see for all. Casa Rosa provided the perfect base for doing all of this - everything we needed was provided in the house. Information provided before and on arrival was super help and very efficient. Lovely evenings cooking dinner on the Bar B, enjoying the evening sun, sipping a glass of the local vino verde. Children enjoyed some down time playing pool. Overall a holiday thoroughly enjoyed by ALL the family in super house , rural setting, 10 mins drive from unspoilt beaches or endless choice of beaches within 30 min drive. Suzanne thank you for your review. I am delighted that you all enjoyed Casa Rosa and this unspoilt area of Portugal. You were fantastic guests and I do hope I can tempt you back sometime in the future. What a beautiful villa ... really lovely, comfortable and spacious villa. We loved the large open plan kitchen dining room that spills out internally into the living room. With it's high vaulted ceiling and roaring fire place it's a nice spot to chill-out and watch a movie. Alternatively you can open up the doors and eat outside and enjoy the rolling countryside (nice change from our usual urban surroundings). The gardens and the pool are immaculate. We spent the festive period with another couple and it was the ideal location to explore the coastline (btw Foz Do Arelho is a must) and the amazing city of Lisbon. So much to love about the area, and i wouldn't hesitate in recommending Casa Rosa .. villa, location and the owner are just awesome and made the whole process from booking, to arrival and of course the stay a very memorable stay. Looking forward to our next trip for sure. THE PERFECT VILLA HOLIDAY !! A STAY AT CASA ROSA IS THE PERFECT PLACE FOR A RELAXING BREAK AWAY FROM IT ALL.THE VILLA IS MAINTAINED TO A VERY HIGH STANDARD,IT'S LOCATION IS PERFECT FOR EXPLORING THIS LOVELY PART OF PORTUGAL.THE GUEST BOOK IS FULL OF RECOMMENDED RESTAURANTS TO ENJOY LOCALLY AS WELL AS MANY OTHER GLOWING REFERENCES FROM OTHER GUESTS.THE OWNER SHARON WAS MOST HELPFUL IN ENSURING OUR HOLIDAY WAS A WONDERFUL EXPERIENCE AND WE WILL BE SURE TO RETURN. Thank you for your review. I am delighted that your holiday at Casa Rosa was such wonderful experience. I was pleased that you were so lucky with the weather enjoying sunny days to finish December 2016. I look forward to welcoming you back to Casa Rosa sometime in the future. You have the choice of five beaches within a 15 minute drive from the villa. All are lovely sandy beaches. Areia Branca is less than 15 minutes drive. Consolacao is 15 minutes drive, a few minutes walk from the beach is a pasteleria (bakery/coffee shop my favourite), everything is freshly baked at their bakery close by and delivered early morning and later in the afternoon . Bread and cakes are both wonderful. Baleal is 15 minutes and one of my favourite beaches, busy with surfers, a few cafes on the beach where you can have a drink or a snack. You can also walk across the beach to the small island of Baleal where again there is a café and spectacular views as you are surrounded by the sea. Aproximately 30 minutes drive is Foz do Areal and the Lagoon. This is a must, just stunning. Many water sports are also available on the lagoon. From Lisbon it is a 45 minute drive. The journey is simple on the A8 motorway. I will provide detailed directions from Lisbon to Casa Rosa with the booking pack. All the main car hire companies are based at the airport. I can help with information on car hire if you wish to email me. Airlines with direct flights: From London: BA, TAP & Easy jet. From: Dublin: Air Lingus. Casa Rosa is set in a small village. 5 minutes drive away you have a larger village, Ruegengo Grande where you have a chemists, pasteleria (coffee/cake shop), butchers and a small daily market in the morning selling fruit & veg and also a fishmonger who will clean and prepare your fish fresh from the local fishing town of Peniche that morning. There is also two shops where you can buy most groceries and fresh bread. 15 minutes drive to the following towns: Bombarral, Obidos, Lourinha, Peniche and day trips to Belenga Island. 30 minutes to the market town of Caldas da Rainha. This is the biggest town, with many shops, all the banks and a daily market in the square. It is under 1 hour to Lisbon and the following are all close enough for a day trip. Sintra, Estoril, Coimbra. You also have Fatima the Holy shrine approximately one hours drive north. Casa Rosa, although set in in peaceful village in the middle of beautiful countryside, you are not isolated and you do have easy access to many towns within a 15 minute drive. Bomborral has several supermarkets and many banks. It is also good for eating out with several restaurants one being my favourite Piri Piri. Bombarral also has two vineyards offering tours and wine tastings and is famous for the wine festival in July each year. Lourinha is the other nearest major town which is famous for its Dinosaur museum as Lourinha and also the village where the villa is are famous for the discovery of dinosaur bones and fossils. The medieval walled town of Obidos is again 15 minutes drive. This is a must to visit with its narrow cobbled streets lined with white washed houses draped with bougainvillea and trailing geraniums there are many restaurants and small bars, great early evening when the place comes to life in the summer. The shops are local crafts and gifts. Peniche, It is very much an old-style fishing town. Every evening the fishing boats leave harbour and return to port during the early morning with their catches of Sea Bream, Sole, Halibut and of course, sardines. The catches are on sale that day in the big covered market in the centre of town and in the many fish restaurants throughout the town. You can book fishing trips and day trips to the Berlenga Islands in the harbour. 30 minutes drive from the villa is the market town of Caldas da Rainha, and also Foz do Arelho with the beautiful beach and lagoon. Casa Rosa is in the perfect location to discover everything this region has to offer. You can enjoy all water sports with schools available near Area Branca, Peniche, Baleal and at the Foz lagoon, you also have two major go-carting tracks within a 15 minute drive, many first class golf courses are availble locally and there is an activity center offering microlite trips over the lagoon, horse riding for the more experienced rider and also bike hire. If you want an active holiday, a relaxing break or a cultural experience, then this is the perfect base for a wonderful holiday. An information file with details of local activities, beaches, places to eat and all other information is available at the villa. Booking Notes: Bookings for a minimum 1 week preferred, short breaks may be available (minimum 3 days, excluding peak holiday dates.) Contact owner to enquire. 25% deposit required with all bookings and balance due 8 weeks before arrival. A £200 refundable deposit for breakages is required with the final payment. This will be refunded within two weeks of departure, after inspection of property. (this is not for minor breakages only larger items). No smoking permitted any where at this property. Also no pets. Changeover Day: Saturday during peak times, but please contact owner with your requirements, who will try to accommodate your request. Notes on prices: Prices are for the property per week in UK Pounds. Less than one week bookings are available (Min 3 nights) excluding peak holiday periods, long term lets may also be considered, please contact owner for details.